The fully automatic and mobile system allows fast and convenient satellite TV. With a dish diameter of 46cm, the Satmaster portable ensures high reception on the move, while itâs suction-cups and ability to operate on a 12, 24 or 240 volt power supply give it the flexibility needed for use in the caravanning, freight and marine market. By pushing the button the fully automatic satellite system will find the satellite in less than 2 minutes. 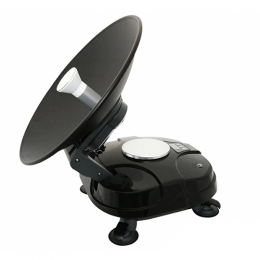 The Satmaster portable classic is programmed for Astra 2.Other satellites can be specified at time of ordering. An additional control unit is not needed. The complete control unit is integrated in the housing. Sturdy and well placed suction feet give a secure fit on all smooth surfaces.